So today I was wondering what to do as my blog post and then I realised I really didn't have much time because of one thing that I needed to do... Revision. So today I thought why not share my top tips that I find help me, so if you are struggling then they may be able to help you. At the minute I am doing my 4th GCSE early! This exam is Culture, Philosophy and Religion. Also known as Religious studies. So I have to learn what feels like a million religious teachings fro different teachings and such. 1. The one thing I find that really helps me is writing my notes out on flash cards. This is because I can write a key word on one side and the definition on the other so I can try and test myself. At the minute Whsmith have a 3 for 2 offer on so I bought 3 Sets. They have normal white ones if you don't want pastel colours, however I also found this easier as it could separate each topic as well. 2. Once you feel confident enough try a practice/past paper. This way you will see the topics you need to study more before the final exam. 3. As well as flash cards/before I write out my flash cards I take longer notes in a notepad. I like to do this in multiple colours because then it is easier to find different quotations and the key terms this way. I bought my revision guides from Waterstones and the paper one was given to me by my school! 5. Take multiple breaks, listen to some music, clear your mind and drink lots of water! I hope these top tips may have helped you! Sorry for a short blog post but obviously I am revising and I just typed this on one of my 'breaks from revising'! 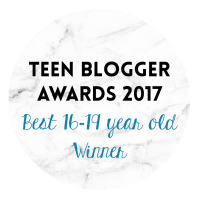 I am now on bloglovin' so feel free to click the pink button on the right and follow me, I will much appreciate it! Good luck to anyone taking exams!